Every year I plan a bicycle tour for whatever family members and friends I can recruit. This year it would be the Erie Canal from Buffalo to Albany, NY. I was able to round up, along with my wife Jeanine, my brother Gary and his wife Lynn, my sister Paula, Jeanine's sister Janelle, and her bicycling friend Marcia. Jeanine and I would take the train from Quincy to Chicago and Janelle and Marcia from Minneapolis/St. Paul to Chicago, where we would join up for the train ride to Buffalo. Paula would drive from NC to WV, meeting up with Gary and Lynn, and then drive to the Buffalo - Depew Amtrak station, where they would park the car for the duration. Due to time commitments, Janelle and Marcia would return home to Minnesota via Amtrak from Utica. Gary, Lynn, and Paula would take Amtrak from Albany back to Buffalo to rejoin their car. Jeanine and I would return via Amtrak to Illinois. Planning for the tour, which began in January, was more difficult than my other trips because the various semi-official Erie Canal Trail websites conflicted with one another and seemed to be obsolete. A map which I received from nyscanals.gov appeared to be more up-to-date. But it showed some sections of trail that did not exist; and the scale was too small for detailed planning. This situation is very different from other long distance bike trails, such as the Katy Trail and the Great Allegheny Passage/C & O Canal, and especially bike routes in Austria and Germany. First of all, I could find no source for mileage between each town along the canal, making it difficult to plan overnight lodging 30-40 miles apart. If I were traveling alone, I would take pot luck; but with a group I felt it necessary to make reservations ahead of time. As it turned out, we passed many motels with empty parking lots, although I would not have expected this based on what I consider to be extremely high room rates quoted months ahead of time. Secondly, it was difficult to determine the current status of the route; i.e., what was bike trail, what was its condition, and what was road. However, once we actually got underway, this turned out to not be a problem because the route was well marked with the official canal trail signs. Moreover, if the sign was missing or we missed the sign at a critical junction, a circle with line protruding painted on the road came to our rescue. I'm sure they were compliments of the Cycling the Erie Canal bike tour. The road portion, principally Bike Route 5 was not a problem. 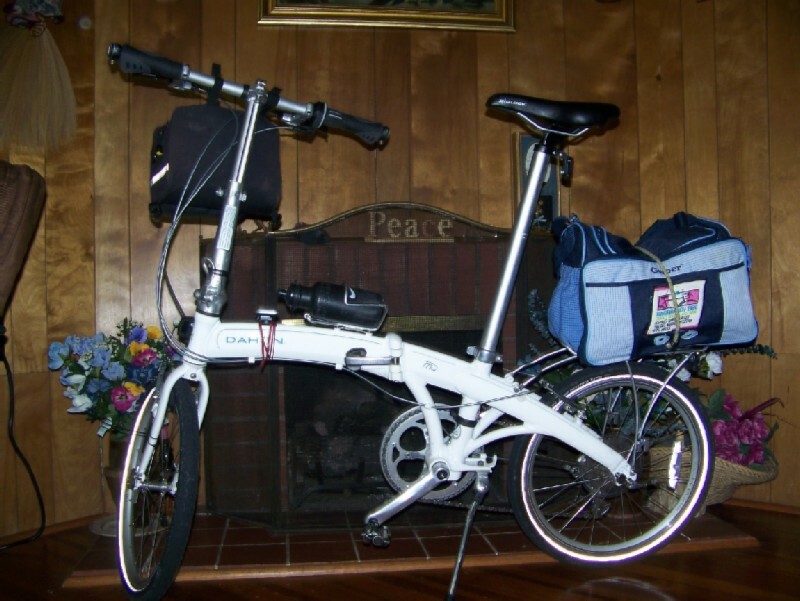 I had decided to put my new Dahon MuP8 folding bike to the test, even though the entire ride on Amtrak was possible with a regular bike. It was easier to handle and saved $60 -- (2 x $10 for round trip bike tickets on the Illinois Zephyr, 2 x $5 for handling in the baggage car round trip on the Lake Shore Limited between Chicago and Buffalo, and 2 x $15 for bike boxes on the Lake Shore (you are free to use your own box; but that was not practical in this case). Fully equiped MuP8 complete with waterproof diaper bag substituting for panniers.